We’ve all eaten our words from time to time, but how taking a cool sip of your favorite beverage through them? 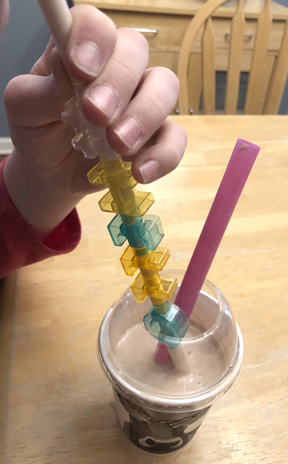 Katie and her son tested this intriguing concept with Spell & Sip customizable straws by Spelly (Amazon, $15). These BPA free straws are advertised for ages 4-99. The set contains 44 pieces. 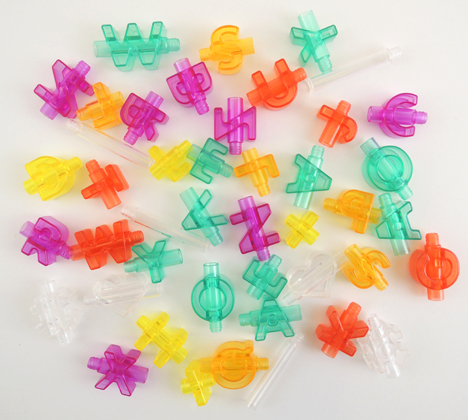 This includes an assortments of alphabet letters, 4 straw ends, and 2 sets of symbols. Our package had four A’s, no V’s and four emojis (2 hash tags and 2 hearts). We thought the letter selection to be bit strange, particularly when many names have multiple vowels or consonants. A child named Violet or Victor would be way disappointed receiving Spell & Sip as a gift. As you can see, each letter and symbol is skewered with a hollow plastic tube connector. 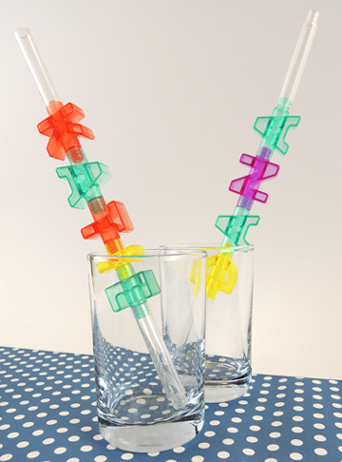 To make a custom straw, snap together your letters, add 2 straw ends, and you’re ready to go! Katie’s son took the lead with testing. Water was first, followed by milk. Both were easy to drink, although there were some bubbles at mouth end of the straw at first. Turns out her son hadn’t attached that end of the straw tightly enough. Once fixed, the bubbles disappeared and there was absolutely no leaking (despite the fact that the connection was still somewhat semi-loose). Next up, a chocolate milkshake from Mooyah, his favorite burger joint. Unfortunately, the thicker consistency of the liquid caused difficulties. With some effort, but he was eventually able to get the shake into his mouth. But the test straw was soon abandoned for the restaurant-provided wider straw (and faster consumption of the shake). Now the real test…cleaning! 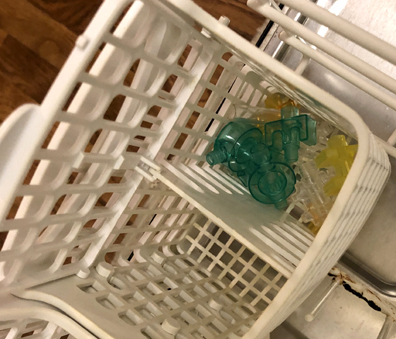 Katie put the used letters and pieces into the silverware basket of her dishwasher, closing the basket lid secretly praying the hot water wouldn’t melt anything. This was doubly risky because there was absolutely nothing on the product’s box that mentioned cleaning or being dishwasher-safe (only a statement that the company is “Not responsible for any damage caused by improper use or care”). However, success! The straw pieces emerged cleaned and not melted. They were still pretty wet, and required extra drying time on a paper towel. 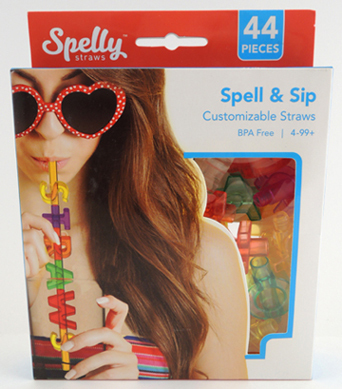 Ultimately, the testing team felt Spelly’s Spell & Sip customizable straws were a fun and super clever way to reinforce letters and spelling (though younger kids may need help with taking the pieces apart). Given the difficulties with milkshake, they don’t suggest drinking thick liquids with this product. Another major issue: the missing letter V in the set. Finally, clean the used straws as soon as possible to avoid any residue drying inside the letter pieces – they tend to stay wet for awhile. Recommended, with thin liquids like water and juice!